AAI O.I.C.W (Objective Individual Combat Weapon) / U.S.A. This weapon was the AAI Corporation entry for the O.I.C.W. program. 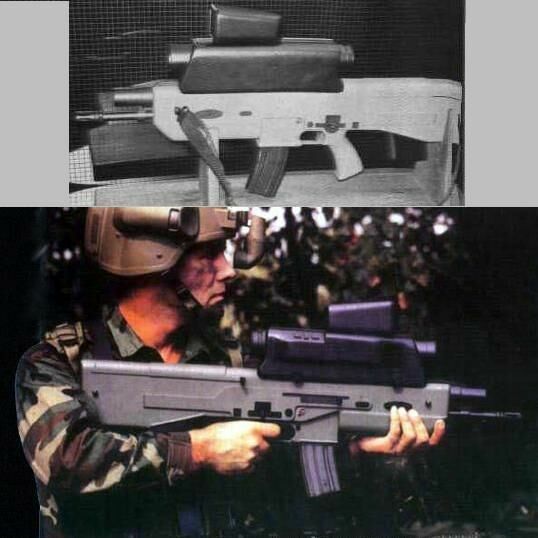 It was essentially a S-E-3-F trigger group equipped assault carbine, chambered for the standard 5'56x45mm-NATO cartridge, fed by a standard STANAG magazine (including BETA-C MAGS), integrating a bull-pup action, 6-rounds box fed, semi-automatic grenade launcher, which was activated by the same trigger than the "normal" carbine weapon, simply selecting the "Grenade Launcher" option on the selector switch. It had an integral aiming module, powered by a battery mounted ON it, and including precision sight systems, night/day vision, grenade fire calculator, and laser rangefinder. It was quite more compact than the ATK-HK "SABRE", although its performance were also minor. It was so rejected at the trials (or so I believe. It could also be it never evolved past prototype phase.